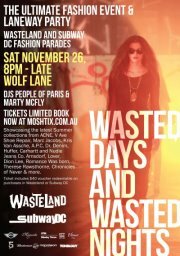 Perth Fashionista : Wasted Days & Wasted Nights! 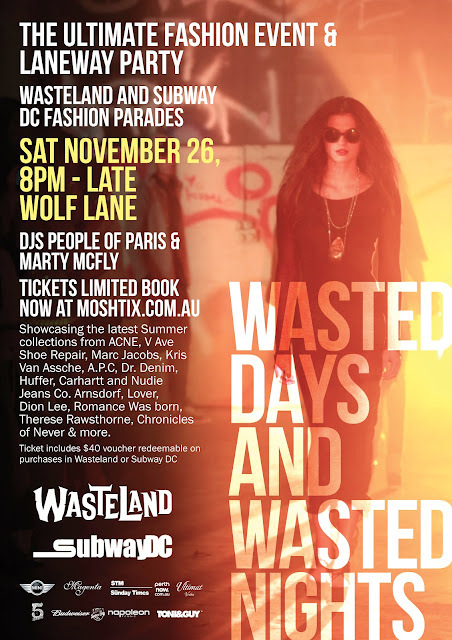 From the heart of Perth’s most renowned fashion district, King Street, Subway DC and Wasteland present the ultimate introduction to Perth’s summer by throwing the party of the year, Wasted Days and Wasted Nights, one of Australia’s most unique fashion events. Last year, this was voted one of Perth's best parties in 2010. The event will host two unisex fashion productions to the sounds of New Zealand DJ duo, People of Paris. This event will see the latest collections from the international fashion scene, with inclusions such as ACNE, Kris Van Assche, A.P.C, Fifth Avenue Shoe Repair, Surface to Air Paris and Nudie Jeans Co. While Australian designers Arnsdorf, Lover, Romance Was Born, Dion Lee, Therese Rawsthorne and Chronicles of Never will be amongst those labels to present the fashion forward crowd with what’s hot in Australia this summer. November 26 - THIS FRIDAY! This is an event not to be missed, so make sure you snap up the last few tickets floating around. You can buy them from Moshtix.